Have you ever wondered about the biggest medical device companies in the world? Maybe you're looking for a large medical device, medical instrument, or biotechnology company that might want to acquire your company or license your research, or perhaps you're looking for a publicly traded medical technology company to invest in? 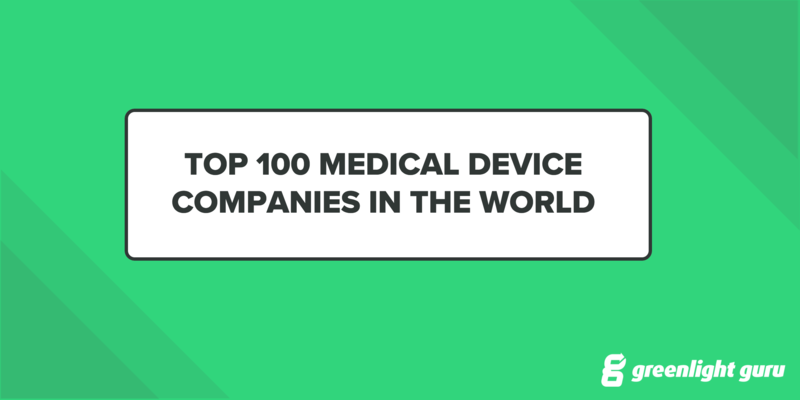 In this exclusive piece of content, we're bringing you a list of the top 100 medical device companies from around the world. What are the top 100 medical device companies in the world by market cap? Which medical device companies spend the most money on R&D? What medical device companies employ the most people around the world? What medical device companies make the most money? Get links to each company's website where you can look up additional product information along with financial data and annual reports. The research for this article was completed in the week of July 22nd 2018 and published on August 6th, 2018. Financial data for "Top 100 Medical Device Companies" is taken from the most recent annual report issued by that firm. Publicly traded companies are obliged to release their financial data, including total revenue and total R&D spending, in annual and quarterly reports, but may choose a what time their fiscal year concludes. As a result, some of the reports have been published on 03/30/2018 and some on 09/30/2017. The majority of the data is derived from annual reports that were published on 12/31/2017, as most firms align their fiscal year-end with the calendar year for simplicity. For complete financial information, visit the website link provided, navigate to investor's information and download the annual report. You'll be able to learn more about your chosen company, including expenses, profits, cash flow statements and more. 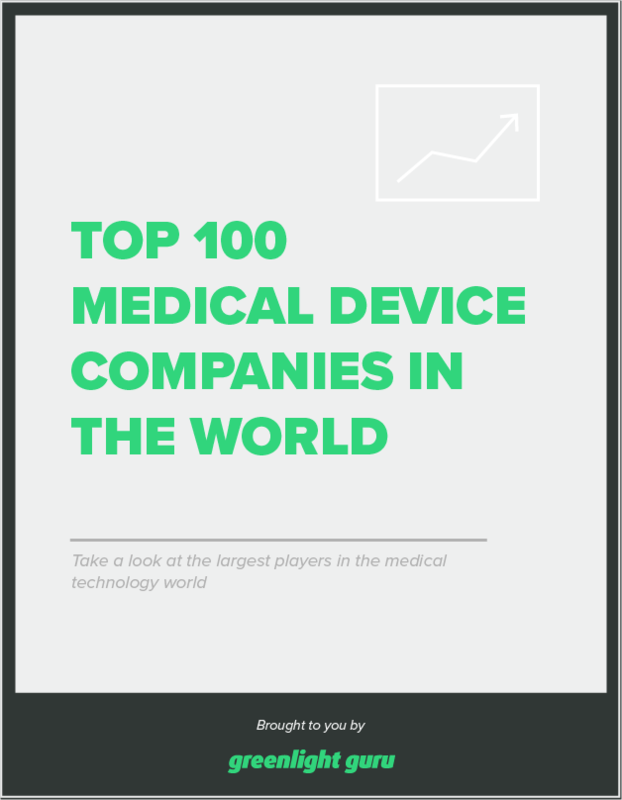 Free Bonus Giveaway: Click here to download our exclusive chart of the top 100 medical device companies in the world. Johnson & Johnson is a medical device, pharmaceutical, and consumer packaged goods company founded in 1886. Headquartered in New Brunswick, New Jersey, the corporation operates 250 subsidiary companies in 60 countries and sells product in 175 countries. It is also the largest independent biotech firm in the world by market cap (342.53B). GE Healthcare provides transformational medical technologies and services that are shaping a new age of patient care. The company’s expertise in electrical systems has translated to industry-leading innovations in medical imaging and information technologies, diagnostics, patient monitoring and manufacturing technologies. GE is one of the largest companies in the world by employee size with 313,000 employees working around the world. Medtronic plc is a medical device company. Its headquarters are in Dublin, Ireland. Its operational headquarters are in Fridley, Minnesota. Medtronic is among the world's largest medical equipment development companies. Its extensive product line includes patient care and monitoring accessories of all kinds, general surgical equipment and medical devices for cardiovascular, diabetic, and neurological applications. Siemens Healthineers is a medical technology company and is headquartered in Erlangen, Germany. The company dates its early beginnings in 1847 to a small family business in Berlin, co-founded by Ernst Werner von Siemens. Siemens is enabling healthcare providers to expand precision medicine and improve the patient experience by digitalizing healthcare. The company has 170 years of experience and 18,000 patents around the world. Baxter International Inc. provides a portfolio of healthcare products. The company operates through North and South America; Europe, Middle East and Africa; and Asia-Pacific segments. It offers peritoneal dialysis and hemodialysis, and additional dialysis therapies and services; renal replacement therapies and other organ support therapies focused in the intensive care unit; sterile intravenous (IV) solutions, IV therapies, infusion pumps, administration sets, and drug reconstitution devices; and parenteral nutrition therapies. Baxter International Inc. was founded in 1931 and is headquartered in Deerfield, Illinois. Fresenius Medical Care AG & Co. KGaA, a kidney dialysis company, provides dialysis care and related services, and other health care services. It offers dialysis treatment and related laboratory and diagnostic services through a network of outpatient dialysis clinics; materials, training, and patient support services comprising clinical monitoring, follow-up assistance, and arranging for delivery of the supplies to the patient's residence; and dialysis services under contract to hospitals in the U.S. for the hospitalized end-stage renal disease (ESRD) patients and for patients suffering from acute kidney failure. Cardinal Health offers distribution, inventory management, data reporting, new product launch support, and chargeback administration services to pharmaceutical manufacturers; pharmacy and medication therapy management, and patient outcomes services to hospitals, other healthcare providers, and payers; and consulting, patient support, and other services to pharmaceutical manufacturers and healthcare providers. Cardinal Health, Inc. was founded in 1979 and is headquartered in Dublin, Ohio. Novartis International AG is a Swiss multinational pharmaceutical company based in Basel, Switzerland. It is one of the largest pharmaceutical companies by both market capitalization and sales and the third-largest Swiss company by revenue. The company’s several divisions design, manufacture and sell medical devices across a wide range of applications, but the company might best be known for its Alcon vision which focuses on eye care products for cataracts, glaucoma and refractive surgery and disposable vision-corrective products. Becton, Dickinson and Company develops, manufactures, and sells medical supplies, devices, laboratory equipment, and diagnostic products worldwide. It operates in two segments, BD Medical and BD Life Sciences. The company markets its products through independent distribution channels and sales representatives to healthcare institutions, life science researchers, clinical laboratories, pharmaceutical industry, and general public. Becton, Dickinson and Company was founded in 1897 and is based in Franklin Lakes, New Jersey. Boston Scientific is primarily known for the development of the Taxus Stent, a drug-eluting stent which is used to open clogged arteries. Essilor International S.A. is a French-based international ophthalmic optics company that designs, manufactures and markets lenses to correct or protect eyesight. Its headquarters is based in Charenton-le-Pont, France. The company formed from the merger of ophthalmic firms Essel and Silor in 1972. In 2017, Essilor is the world’s largest manufacturer of ophthalmic lenses. The company operate 481 labs, 34 manufacturing plants, and holds a total of 8,775 patents around the world. Allergan plc is a multinational company in the pharmaceutical industry that produces branded drugs and performs pharmaceutical research and development. Allergan markets a portfolio of leading brands and best-in-class products for the central nervous system, eye care, medical aesthetics and dermatology, gastroenterology, women's health, urology and anti-infective therapeutic categories. Allergan is an industry leader in Open Science, the Company’s R&D model, which defines our approach to identifying and developing game-changing ideas and innovation for better patient care. This approach has led to Allergan building one of the broadest development pipelines in the pharmaceutical industry. The 3M Company, formerly known as the Minnesota Mining and Manufacturing Company, is an American multinational conglomerate corporation operating in the fields of industry, health care, and consumer goods. 3M’s innovative healthcare brands include Cavilon, Clarity, Coban, Codefinder, FUTURO, Littmann, Peltor, Petrifilm, Tegaderm and Unitek. The company builds medical devices, food safety testing products and health information systems. Abbott Laboratories is an American health care company with headquarters in Lake Bluff, Illinois, United States and the world's ninth-largest independent biotech company by market cap ($106.9 B). The massive firm is operated in seven industrial divisions – Abbott Diabetes Care, Abbott Diagnostics Division, Abbott Molecular Diagnostics, Abbott Nutrition International, Abbott Point-of-care, Abbott Vascular Division and the Established Pharmaceuticals Division. A truly global company, Abbott does business in over 150 countries around the world. Zimmer Biomet was founded in 1927 to produce aluminum splints and is part of the medical devices business cluster in Warsaw, Indiana. The company’s core business includes the design, development and manufacturing of orthopaedic products – knee, hip, shoulder, elbow and ankle artificial joints and prosthetic dental devices. Zimmer operates in 25+ countries around the world and has grown largely through acquisitions, most recently that of Biomet Inc. in 2014 for $13.4 billion. Dr. Shibasaburo Kitasato and other physicians founded Terumo in 1921, when importation of medical thermometers ceased in the aftermath of World War I, spurring the need to manufacture the instruments domestically. Over the years, Terumo has provided new value by grappling with health care issues in areas such as infection control, prevention of medical errors, the demand for minimally invasive treatments, and improvements in both medical cost efficiency and patient quality of life (QOL). The Terumo Group now conducts business in over 160 nations, expanding our concept of “society” to embrace a global perspective. The Group has a history dating back 160 years to the family enterprise of Thomas James Smith who opened a small pharmacy in Hull, England in 1856. On his death in 1896, his nephew Horatio Nelson Smith took over the management of the business. A few days after the declaration of World War 1 in 1914, Horatio Nelson Smith (the nephew of the company founder T. J Smith) met with an envoy of the French President in London. The company was awarded a contract to supply £350,000 of surgical and field dressings, to be delivered in five months. Today, the company has grown rapidly through acquisitions and is listed in the FTSE-100, an index fund comprised of the largest 100 companies on the London Stock Exchange by Market Cap. Getinge AB is a global medical technology company, founded in Sweden in 1904. The firm provides equipment and systems within healthcare and life sciences. Getinge is a leading global provider of products and systems that contribute to quality enhancement and cost efficiency within healthcare and life sciences. The company was organized into three distinct business areas: Infection Control (Getinge), Extended Care (Arjohuntleigh) and Medical Systems (Maquet), but it was announced in March of 2017 that the company would unify its brands under the Getinge name moving forward. Align Technology is a manufacturer of 3D digital scanners and clear aligners used in orthodontics. It is headquartered in San Jose, California; it manufactures the aligners in Juarez, Mexico and its scanners in Israel. In 1999, Align Technology pioneered the invisible orthodontics market with the introduction of the Invisalign system and by 2001 had manufactured one million unique clear aligners. The Invisalign system is offered in more than 90 countries worldwide by Invisalign-trained doctors to their adult and teenage patients. Olympus Corporation is a Japanese manufacturer of optics and reprography products. Olympus was established on 12 October 1919, initially specializing in microscopes and thermometers. Today, the company earns roughly 80% of its annual revenue through its medical device business, with the remaining coming from its scientific solutions and imaging departments. Olympus primarily manufactures and sells Endo Therapy devices, surgical devices and endoscopes. In collaboration with leading clinics, research institutes and universities, Straumann conducts research, develops and manufactures dental implants, instruments, prosthetics, as well as dental biomaterials for use in tooth replacement and restoration, or to prevent tooth loss. As technological advancements are changing dentistry fundamentally, Straumann offers a broad range of products and solutions for both conventional treatment and digital workflows including guided surgery, intra-oral scanning and CAD/CAM restorations. Intuitive Surgical, Inc. (NASDAQ: ISRG) is a global technology leader in minimally invasive robotic-assisted surgery. The Company's da Vinci®Surgical System enables surgeons to operate minimally invasively through a few small incisions or the belly button from a nearby ergonomic console. The da Vinci System features a magnified 3D HD vision system and tiny wristed instruments that bend and rotate far greater than the human hand. As a result of this technology, da Vinci enables surgeons to operate with enhanced vision, precision and control. The Danaher Corporation is a globally diversified conglomerate with its headquarters in Washington, D.C., United States. Danaher is #144 on the 2017 Fortune 500 list. Its products are concentrated in the fields of design, manufacturing, and marketing of industrial, healthcare and consumer products. It operates in four segments: environmental & applied solutions, life sciences, diagnostics, and dental. Abiomed (NASDAQ: ABMD) is a leading provider of medical devices that provide circulatory support. Their products are designed to enable the heart to rest by improving blood flow and/or performing the pumping of the heart. CEO, Chairman, and President Michael R. Minogue has focused the company’s efforts on developing ground-breaking technologies designed to improve the patient outcomes focused on native heart recovery. Founded in 1981 to develop the world’s first artificial heart, Abiomed has remained dedicated to finding ways to bring the most advanced and beneficial technology to patients and physicians. ResMed Inc., incorporated on March 31, 1994, is a holding company. The Company is engaged in the development, manufacturing, distribution and marketing of medical devices and cloud-based software applications that diagnose, treat and manage respiratory disorders, including sleep disordered breathing (SDB), chronic obstructive pulmonary disease (COPD), neuromuscular disease and other diseases. Waters Corp., a publicly traded corporation (NYSE: WAT) headquartered in Milford, Massachusetts, holds worldwide leading positions in complementary analytical technologies - liquid chromatography, mass spectrometry, rheometry and microcalorimetry. These markets account for approximately $5.0 billion of the estimated $20 - $25 billion worldwide analytical instrumentation market. Specifically, the company designs, manufactures, sells and services ultra performance liquid chromatography (UPLC), high performance liquid chromatography (HPLC), chromatography columns and chemistry products, mass spectrometry (MS) systems, thermal analysis and rheometry instruments. Waters Corp. operates in two divisions: Waters Division and TA Instruments. Teleflex Incorporated, incorporated on June 25, 1943, is a provider of medical technology products. The Company primarily designs, develops, manufactures and supplies single-use medical devices used by hospitals and healthcare providers for common diagnostic and therapeutic procedures in critical care and surgical applications. The Company operates through six segments: Vascular North America; Anesthesia North America; Surgical North America; Europe, Middle East and Africa (EMEA); Asia, and Original Equipment Manufacturer and Development Services (OEM). Edwards Lifesciences Corporation, incorporated on September 10, 1999, is a manufacturer of heart valve systems and repair products used to replace or repair a patient's diseased or defective heart valve. The Company is globally engaged in patient-focused innovations for structural heart disease and critical care monitoring. Its segments include United States, Europe, Japan and Rest of World. Its products are categorized into three areas: Transcatheter Heart Valve Therapy, Surgical Heart Valve Therapy and Critical Care. It also develops hemodynamic monitoring systems that are used to measure a patient's cardiovascular function in the hospital setting. The Cooper Companies, Inc., incorporated on March 4, 1980, is a global medical device company. The Company operates through two business units: CooperVision, Inc. and CooperSurgical, Inc. CooperVision offers soft contact lenses for the vision correction market. CooperSurgical offers an array of products and services focused on advancing the health of families through a portfolio of products and services focusing on women's health, fertility and diagnostics. CooperVision develops, manufactures and markets a range of single-use, two-week and monthly contact lenses, featuring various materials and optics. CooperVision's products are designed to solve vision challenges, such as astigmatism, presbyopia, ocular dryness and eye fatigue; with a collection of spherical, toric and multifocal contact lenses. Hologic, Inc., incorporated on January 18, 1990, is a developer, manufacturer and supplier of diagnostics products, medical imaging systems and surgical products with an emphasis on women's health. The Company operates through four segments: Diagnostics, Breast Health, GYN Surgical and Skeletal Health. The Company sells and services its products through a combination of direct sales and service personnel and a network of independent distributors and sales representatives. Varian Medical Systems, Inc., incorporated on January 22, 1976, is a manufacturer of medical devices and software for treating cancer and other medical conditions with radiotherapy, radiosurgery, proton therapy and brachytherapy medical devices and software for treating cancer and other medical conditions with radiotherapy, radiosurgery, proton therapy and brachytherapy. The Company also has Varian Particle Therapy (VPT) and the operations of the Ginzton Technology Center (GTC). Its VPT business develops, designs, manufactures, sells and services products and systems for delivering proton therapy, another form of external beam radiotherapy using proton beams for the treatment of cancer. DENTSPLY SIRONA Inc., incorporated on February 15, 1983, is a manufacturer of professional dental products and technologies. The Company develops, manufactures, and markets solutions offering, including dental and oral health products, as well as other consumable medical devices. The Company operates through two segments: Dental and Healthcare Consumables, and Technologies. The dental industry encompasses the diagnosis, treatment and prevention of disease and ailments of the teeth, gums and supporting bone. The Company's principal dental product categories are dental consumable products, dental laboratory products, dental specialty products and dental equipment. Additionally, the Company's consumable medical device products are used for urological and surgical applications. STERIS plc provides infection prevention and other procedural products and services. The Company operates through four segments: Healthcare Products, which offers infection prevention and procedural solutions for healthcare providers, including capital equipment and related maintenance, and installation services, as well as consumables; Healthcare Specialty Services, which provides a range of specialty services for healthcare providers, including hospital sterilization services, instrument and scope repairs, and linen management; Life Sciences, which offers capital equipment and consumable products, and equipment maintenance and specialty services for pharmaceutical manufacturers and research facilities, and Applied Sterilization Technologies, which offers contract sterilization and laboratory services for medical device and pharmaceutical customers and others. West Pharmaceutical Services, Inc., incorporated on July 27, 1923, is a manufacturer of packaging components and delivery systems for injectable drugs and healthcare products. The Company's products include vial containment solutions, pre-fillable systems, self-injection platforms, cartridge systems and components, reconstitution and transfer systems, intradermal delivery solutions, specialty components, and contract manufacturing and analytical services. Hill-Rom Holdings, Inc., incorporated on August 7, 1969, is a global medical technology company. The Company partners with health care providers across care settings, by focusing on patient care solutions that improve clinical and economic outcomes in five core areas: advancing mobility, wound care and prevention, patient monitoring and diagnostics, surgical safety and efficiency and respiratory health. Its segments include Patient Support Systems, Front Line Care and Surgical Solutions. ICU Medical, Inc., incorporated on January 9, 1992, is engaged in the development, manufacture and sales of medical devices used in infusion therapy, oncology and critical care applications. The Company's product line includes needlefree connection devices, custom infusion sets, closed system transfer devices (CSTD) for the handling of hazardous drugs, advanced sensor catheters, needlefree closed blood sampling systems, disposable pressure transducer systems and hemodynamic monitoring systems. As of December 31, 2016, its products were used in acute care hospitals and ambulatory clinics in more than 65 countries throughout the world. Integra LifeSciences Holdings Corporation, incorporated on June 19, 1989, is a medical technology company. The Company focuses on the development, manufacturing, and marketing of surgical implants and medical instruments. The Company's segments include Specialty Surgical Solutions, and Orthopedics and Tissue Technologies. The Company's products are used in neurosurgery, extremity reconstruction, orthopedics and general surgery. B. Braun is one of the world's leading providers and manufacturers of healthcare solutions today. Every service that B. Braun provides incorporates the entirety of our knowledge and skills, the company's deep understanding of users' needs, and extensive expertise since 1839. With its constantly growing portfolio of effective medical care solutions, B. Braun makes a substantial contribution towards protecting and improving people's health. In total, the B. Braun product range comprises 5,000 different products, 95 percent of which are manufactured by the company. Masimo Corporation, incorporated on May 7, 1996, is a medical technology company that develops, manufactures and markets a range of non-invasive patient monitoring technologies. The Company's business is Measure-through Motion and Low Perfusion pulse oximetry monitoring, known as Masimo Signal Extraction Technology (SET) pulse oximetry. Its product offerings include non-invasive monitoring of blood constituents with an optical signature, optical organ oximetry monitoring, electrical, brain function monitoring, acoustic respiration monitoring and exhaled gas monitoring. Haemonetics Corporation (Haemonetics), incorporated on August 29, 1985, is a healthcare company. The Company provides various products to customers involved in the processing, handling and analysis of blood. The Company's segments include Japan, EMEA, North America Plasma and All Other. It provides plasma collection systems and software, which enable plasma fractionators to make pharmaceuticals. It provides analytical devices for measuring hemostasis, which enable healthcare providers to manage their patients' bleeding risk. Haemonetics makes blood processing systems, and software, which tracks blood components. Haemonetics supplies systems and software, which facilitate blood transfusions and cell processing. Globus Medical, Inc., incorporated on March 3, 2003, is a medical device company. The Company is focused on developing products for patients with musculoskeletal disorders. It is focused on products to treat patients with spine disorders. The Company's products fall under categories, which include Innovative Fusion and Disruptive Technologies. The Innovative Fusion category products include fusion products to treat spinal disorders for the entire spine, and they can be used in various surgical approaches. The Disruptive Technologies category represents a shift in the treatment of spinal disorders by allowing for surgical procedures and the treatment of spinal disorders. Insulet Corporation, incorporated on July 20, 2000, is engaged in the development, manufacturing and sale of the OmniPod Insulin Management System (the OmniPod System), an insulin delivery system for people with insulin-dependent diabetes. The Omnipod System features a self-adhesive disposable tubeless Omnipod device, which is worn on the body for approximately three days at a time and its wireless companion, the handheld Personal Diabetes Manager (PDM). The Omnipod System features two discreet devices that eliminate the need for a bulky pump, tubing and separate blood glucose meter, provides for virtually pain-free automated cannula insertion, communicates wirelessly and integrates a blood glucose meter. Inogen, Inc., a medical technology company, primarily develops, manufactures, and markets portable oxygen concentrators for patients, physicians and other clinicians, and third-party payors in the United States and internationally. The company’s oxygen concentrators are used to deliver supplemental long-term oxygen therapy to patients suffering from chronic respiratory conditions. It offers Inogen One, a portable device that concentrate the air around the patient to provide a single source of supplemental oxygen; and Inogen At Home stationary oxygen concentrators, as well as related accessories. Merit Medical Systems, Inc., incorporated on July 28, 1987, is a manufacturer and marketer of disposable medical devices used in a range of interventional, diagnostic and therapeutic medical procedures. The Company operates in two segments: cardiovascular and endoscopy. The cardiovascular segment consists of cardiology and radiology devices, which assist in diagnosing and treating coronary arterial disease, peripheral vascular disease and other non-vascular diseases, and includes embolotherapeutic, cardiac rhythm management (CRM), electrophysiology (EP), and interventional oncology and spine devices. Its endoscopy segment consists of gastroenterology and pulmonology medical devices, which assist in the palliative treatment of expanding esophageal, tracheobronchial and biliary strictures caused by malignant tumors. Nuvasive, Inc., incorporated on July 21, 1997, is a medical device company. The Company focuses on developing minimally-disruptive surgical products and procedurally-integrated solutions for the spine surgery. The Company's product portfolio focuses on applications for spine fusion surgery, including biologics used to aid in the spinal fusion process. The Company's principal product offering includes a minimally-disruptive surgical platform called Maximum Access Surgery (MAS). Halyard Health, Inc. is a medical technology company focused on eliminating pain, speeding recovery and preventing infection for healthcare providers and patients in more than 90 countries. Headquartered in Alpharetta, Georgia, Halyard is committed to addressing some of today’s most important healthcare needs, such as reducing the use of opioids while helping patients move from surgery to recovery. Halyard’s Medical Devices business segment develops, manufactures and markets clinically superior solutions around the globe. Wright Medical Group N.V. is a medical device company. The Company is focused on extremities and biologics products. The Company's segments include U.S. Lower Extremities & Biologics, U.S. Upper Extremities and International Extremities & Biologics. As of December 25, 2016, the Company offered a product portfolio of approximately 180 extremities products and over 20 biologics products that are designed to provide solutions to its surgeon customers. CONMED Corporation, incorporated on February 10, 1970, is a medical technology company. The Company is engaged in the development, manufacturing and sale on a global basis of surgical devices and related equipment. The Company provides surgical devices and equipment for minimally invasive procedures. The Company's products are used by surgeons and physicians in a range of specialties, including orthopedics, general surgery, gynecology, neurosurgery and gastroenterology. The Company's product lines consist of orthopedic surgery, general surgery and surgical visualization. As of December 31, 2016, the Company's products are distributed domestically directly to over 6,000 hospitals, surgery centers and other healthcare institutions, as well as through medical specialty distributors. Prestige Brands Holdings, Inc., incorporated on June 24, 2004, is engaged in the marketing, sales and distribution of over-the-counter healthcare products to mass merchandisers, drug stores, supermarkets, and club, convenience, and dollar stores in North America (the United States and Canada) and in Australia, and certain other international markets. The Company operates through two segments: North American Over-the-Counter (OTC) Healthcare and International Over-the-Counter Healthcare. NxStage Medical, Inc., incorporated on October 20, 1998, is a medical technology company. The Company develops, manufactures and markets products and services for patients suffering from chronic or acute kidney failure. The Company operates through three segments: System One, In-Center and Services. The Company sells its products in and provides its services in three markets: home, critical care and in-center. Its other business activities include manufacturing of dialyzers for sale to Asahi Kasei Kuraray Medical Co. (Asahi). The Company's product offerings include Home Dialysis, Next-Generation Hemodialysis System, Critical Care, Next-Generation Critical Care System, In-Center and NxStage Kidney Care. Nevro Corp., incorporated on October 4, 2006, is a global medical device company. The Company focuses on providing products that improve the quality of life of patients suffering from chronic pain. The Company has developed and commercialized the Senza spinal cord stimulation (SCS) system, an evidence-based neuromodulation platform for the treatment of chronic pain. The Company's HF10 therapy is designed to deliver neuromodulation solutions for treating chronic pain. HF10 therapy enables patients to achieve sustained pain relief without paresthesia, thus enabling its patients to avoid the uncomfortable shocking or jolting sensations commonly associated with paresthesia. Luminex Corporation, incorporated on June 19, 1998, develops, manufactures and sells biological testing technologies with applications throughout the diagnostics, pharmaceutical and life sciences industries. The Company's products are focused on the molecular diagnostic testing market, which includes human genetics, personalized medicine and infectious disease segments. Glaukos Corporation, incorporated on July 14, 1998, is an ophthalmic medical technology company. The Company focuses on the development and commercialization of products and procedures for the treatment of glaucoma. It has developed the micro-invasive glaucoma surgery (MIGS) to serve as an alternative to the traditional glaucoma treatment and management paradigm. It offers iStent, an MIGS device. The iStent is a micro-bypass stent inserted through the small corneal incision made during cataract surgery and placed into Schlemm's canal, a circular channel in the eye that collects aqueous humor and delivers it back into the bloodstream. It is developing three additional pipeline products: the iStent Inject, the iStent Supra and iDose. The iStent Inject includes two stents pre-loaded in an auto-injection inserter. The iStent Supra is designed to access an alternative drainage space within the eye. iDose is a drug delivery system that is designed to be implanted in the eye to continuously deliver therapeutic levels of medication for extended periods of time to lower intraocular pressure in glaucoma patients. Atrion Corporation (Atrion), incorporated on December 30, 1996, is engaged in developing and manufacturing products, primarily for medical applications. The Company's medical products range from fluid delivery devices to ophthalmic and cardiovascular products. Its fluid delivery products include valves that promote infection control and needle safety. It has developed a range of valves designed to fill, hold and release controlled amounts of fluids or gasses on demand for use in various intubation, intravenous, catheter and other applications in areas, such as anesthesia and oncology. Cardiovascular Systems, Inc., incorporated on December 6, 2000, is a medical technology company. The Company is engaged in treating patients suffering from peripheral and coronary artery diseases, including those with arterial calcium. The Company develops an orbital atherectomy technology for both peripheral and coronary commercial applications. Its peripheral artery disease (PAD) systems are catheter-based platforms capable of treating a range of plaque types in leg arteries both above and below the knee. Orthofix International N.V. (Orthofix), incorporated on October 19, 1987, is a global medical device company. The Company is focused on providing reconstructive and regenerative orthopedic and spine solutions to physicians. The Company operates through four segments: BioStim, Biologics, Extremity Fixation and Spine Fixation. The Company provides an array of implants designed for use primarily in cervical, thoracic and lumbar fusion surgeries. These implants are made of either metal or a thermoplastic compound called Polyetheretherketones (PEEK). The Company also provides an array of implants designed for use primarily in cervical, thoracic and lumbar fusion surgeries. These implants are made of either metal or a thermoplastic compound called Polyetheretherketones (PEEK). CryoLife’s mission is to restore patients’ health and quality of life by delivering innovative technologies. CryoLife is one of the world’s leading contemporary medical device companies, providing preserved human tissues for cardiac and vascular surgeries, mechanical heart valves for aortic or mitral valve replacement, surgical adhesives and sealants, cardiac lasers for treatment of refractory angina, and state-of-the-art technology and surgical training in adult and pediatric cardiovascular surgery. Natus Medical Incorporated (Natus) offers medical equipment, software, supplies and services for the diagnosis, monitoring, and treatment of impairments and disorders affecting newborns, the brain, nerves, muscles, balance, mobility and hearing. Natus is organized into three strategic business units: neuro, newborn care and otometrics. OraSure Technologies, Inc. (OraSure), incorporated on May 5, 2000, is involved in the development, manufacture, marketing and sale of oral fluid diagnostic products and specimen collection devices using its technologies, as well as other diagnostic products, including immunoassays and other in vitro diagnostic tests that are used on other specimen types. The Company operates in two segments: OSUR and DNAG. OSUR consists of the development, manufacture and sale of diagnostic products, specimen collection devices, and medical devices. DNAG or molecular collection systems business consists primarily of the development, manufacture and sale of oral fluid collection devices that are used to collect, stabilize, and store samples of genetic material for molecular testing. K2M Group Holdings, Inc., incorporated on June 29, 2010, is a medical device company focused on designing, developing and commercializing spine and minimally invasive technologies and techniques. The Company's solutions are focused on achieving three-dimensional Total Body Balance. The Company's spine products are used by spine surgeons to treat spinal pathologies, such as deformity (primarily scoliosis), trauma and tumor. The Company's products consist of implants, disposables and instruments, which are marketed and sold primarily to hospitals for use by spine surgeons. As of December 31, 2016, the Company's product portfolio consisted of 83 product lines that are used in complex spine, minimally invasive surgery (MIS) and degenerative surgeries. Mesa Laboratories, Inc., incorporated on March 26, 1982, is focused primarily on quality control products and services. The Company operates through four segments: Instruments, Continuous Monitoring, Biological Indicators and Cold Chain. The Instruments Division designs, manufactures, and markets quality control instruments and disposable products utilized in connection with the healthcare, pharmaceutical, food and beverage, medical device, industrial hygiene, environmental air sampling and semiconductor industries. Cutera, Inc., incorporated on August 10, 1998, is a medical device company. The Company is engaged in the design, development, manufacture, marketing and servicing of laser and other energy-based aesthetics systems for practitioners across the world. The Company offers products based on product platforms, such as enlighten, excel HR, truSculpt, excel V and xeo, each of which enables physicians and other practitioners to perform aesthetic procedures for customers. Each of its laser and other energy-based platforms consists of one or more hand pieces and a console that incorporates a universal graphical user interface, a laser or other energy-based module, control system software and high voltage electronics. Endologix, Inc., incorporated on June 2, 1993, is engaged in developing, manufacturing, marketing and selling medical devices for the treatment of aortic disorders. The Company's products are intended for the treatment of abdominal aortic aneurysms (AAA). The AAA products are built on one of two platforms, including traditional minimally invasive endovascular repair (EVAR) or endovascular sealing (EVAS), its solution for sealing the aneurysm sac while maintaining blood flow through blood flow lumens. Utah Medical Products, Inc. (UTMD), incorporated on April 21, 1978, is engaged in the business of producing medical devices that are disposable and for hospital use. The Company's product categories include labor and delivery/obstetrics; neonatal intensive care; gynecology/urology/electrosurgery, and blood pressure monitoring. UTMD markets a range of medical devices used in care areas, such as the neonatal intensive care unit (NICU), the labor and delivery (L&D) department and the women's health center in hospitals, as well as products sold to outpatient clinics and physician's offices. Domestically, UTMD's medical devices are sold directly to clinical end user facilities by the Company's own direct sales representatives and independent manufacturers' representatives. SeaSpine Holdings Corporation, incorporated on February 12, 2015, is a medical technology company. The Company is focused on the design, development and commercialization of surgical solutions for the treatment of patients suffering from spinal disorders. The Company operates through the development, manufacture and marketing of orthobiologics and spinal fusion hardware segment. The Company has a portfolio of orthobiologics and spinal fusion hardware solutions to meet the varying combinations of products that neurosurgeons and orthopedic spine surgeons need to perform fusion procedures in the lumbar, thoracic and cervical spine. Consort Medical PLC is a contract development and manufacturing organization (CDMO). The Company's principal activities include designing, development and manufacture of medical drug delivery devices and services for the pharmaceutical industry. The Company operates through two segments: Bespak and Aesica. Bespak's core business is the manufacture of inhaled drug delivery devices for life sciences partners and its operations are based in the United Kingdom. The Aesica business manufactures and sells active pharmaceutical ingredients (API), formulated pharmaceutical products and packaging services to the pharmaceutical industry and its operations are based in the United Kingdom and Europe. It offers its services to customers, such as pharmaceutical companies and life sciences. Its device products include metered dose inhalers, dry powder devices, actuators, dose counters, disposable auto-injectors, nasal devices and point-of-care diagnostics devices. AtriCure, Inc., incorporated on October 31, 2000, is an atrial fibrillation (Afib) solutions company. The Company develops, manufactures, and sells devices designed primarily for the surgical ablation of cardiac tissue and systems designed for the exclusion of the left atrial appendage. The Company has various product lines for the ablation of cardiac tissue, including its Isolator Synergy Ablation System, for the treatment of persistent and longstanding persistent forms of Afib in patients undergoing certain open concomitant procedures. The Company offers various minimally invasive ablation devices and access tools to facilitate less invasive cardiac and thoracic surgery. AngioDynamics, Inc., incorporated on July 30, 1992, designs, manufactures and sells a range of medical, surgical and diagnostic devices used by professional healthcare providers for vascular access, for the treatment of peripheral vascular disease, and for use in oncology and surgical settings. The Company's devices are used in minimally invasive, image-guided procedures. The Company offers products within three product groupings: Peripheral Vascular, Vascular Access and Oncology/Surgery. ViewRay, Inc., incorporated on October 6, 2013, through its subsidiary ViewRay Technologies, Inc., designs, manufactures and markets MRIdian, the magnetic resonance imaging (MRI)-guided radiation therapy system to image and treat cancer patients simultaneously. The Company offers radiation therapy technology combined with magnetic resonance imaging. MRIdian integrates MRI technology, radiation delivery and the Company's software to locate, target and track the position and shape of soft-tissue tumors while radiation is delivered. LeMaitre Vascular, Inc., incorporated on June 15, 1998, is a provider of medical devices for the treatment of peripheral vascular disease. The Company develops, manufactures and markets medical devices and implants used primarily in the field of vascular surgery. It is engaged in the design, marketing, sales and technical support of medical devices and implants for the treatment of peripheral vascular disease industry segment. The Company's product lines include valvulotomes, balloon catheters, carotid shunts, biologic vascular patches, radiopaque marking tape, anastomotic clips, remote endarterectomy devices, laparoscopic cholecystectomy devices, prosthetic vascular grafts, biologic vascular grafts and powered phlebectomy devices. Invacare Corporation, incorporated on March 23, 1971, is a manufacturer and distributor for medical equipment used in non-acute care settings. The Company designs, manufactures and distributes medical devices help people to move, breathe, rest and perform essential hygiene. The Company's geographical segments are Europe, North America and Asia/Pacific. The Company provides medical device solutions for congenital (cerebral palsy, muscular dystrophy and spina bifida), acquired (stroke, spinal cord injury, traumatic brain injury, post-acute recovery and pressure ulcers) and degenerative (amyotrophic lateral sclerosis, multiple sclerosis, chronic obstructive pulmonary disease (COPD), elderly and bariatric) ailments. GenMark Diagnostics, Inc., incorporated on February 12, 2010, is a molecular diagnostics company. The Company is focused on developing and commercializing multiplex molecular tests that aid in the diagnosis of complex medical conditions. The Company develops and commercializes multiplex molecular tests based on its eSensor electrochemical detection technology. It offers four Food and Drug Administration (FDA)-cleared diagnostic tests which run on its XT-8 instrument; its Respiratory Viral Panel; its Cystic Fibrosis Genotyping Test; its Warfarin Sensitivity Test, and its Thrombophilia Risk Test. Intersect ENT, Inc., incorporated on October 6, 2003, is a commercial-stage drug-device company. The Company develops drugs for patients with ear, nose and throat (ENT) conditions. The Company has developed a drug releasing bioabsorbable implant technology that enables targeted and sustained release of therapeutic agents. This targeted drug delivery technology is designed to allow ENT physicians to manage patient care. The Company's commercial products are the PROPEL and PROPEL mini drug-releasing implants for patients undergoing sinus surgery to treat chronic sinusitis. AxoGen, Inc., incorporated on June 20, 1977, offers surgical solutions for peripheral nerve injuries. The Company provides products and education to improve surgical treatment algorithms for peripheral nerve injuries. Its portfolio of products includes Avance Nerve Graft, AxoGuard Nerve Connector, AxoGuard Nerve Protector and Avive Soft Tissue Membrane. Along with these core surgical products, the Company also offers the AxoTouch Two-Point Discriminator, and AcroVal Neurosensory and Motor Testing System. These evaluation and measurement tools assist healthcare professionals in detecting changes in sensation; assessing return of sensory, grip and pinch function; evaluating treatment interventions, and providing feedback to patients on nerve function. STAAR Surgical Company (STAAR), incorporated on April 3, 1986, designs, develops, manufactures and sells implantable lenses for the eye and delivery systems used to deliver the lenses into the eye. The Company operates in the ophthalmic surgical market segment. The Company's principal products are intraocular lenses (IOLs) used in cataract surgery and implantable collamer lenses (ICLs) used in refractive surgery. The Company makes lenses used across the world in corrective or refractive surgery and makes lenses for use in surgery that treats cataracts. Tandem Diabetes Care, Inc., incorporated on January 7, 2008, is a medical device company. The Company is engaged in designing, developing and commercializing products for people with insulin-dependent diabetes. The Company manufactures and sells over three insulin pump products in the United States that are designed to address insulin-dependent diabetes market, which include t:slim Insulin Delivery System (t:slim), t:flex Insulin Delivery System (t:flex) and t:slim G4 Insulin Delivery System (t:slim G4). The Company's technology platform features Micro-Delivery Technology, a miniaturized pumping mechanism, which draws insulin from a flexible bag within the pump's cartridge rather than relying on a syringe and plunger mechanism. Nemaura Medical Inc., a medical technology company, discovers, develops, and commercializes specialty medical devices. It provides sugarBEAT, a non-invasive continuous glucose monitoring device for use by persons with Type I and Type II diabetes, as well as for screening pre-diabetic patients. The company was founded in 2009 and is headquartered in Loughborough, the United Kingdom. MiMedx Group, Inc. (MiMedx), incorporated on February 28, 2008, is an integrated developer, processor and marketer of regenerative biomaterial products and bioimplants human placental tissue, skin and bone. The Company operates in the Regenerative Biomaterials segment, which includes the design, manufacture, and marketing of products and tissue processing services for the Wound Care, Surgical, Sports Medicine, Ophthalmic and Dental market categories. RTI Surgical, Inc. is a global surgical implant company providing surgeons with biologic, metal and synthetic implants. It operates through the following business lines: Spine, Sports Medicine and Orthopedics, Surgical Specialties, Cardiothoracic, International, and Global Commercial. The Spine business line designs, manufactures, and distributes surgical implants, instruments, and biologics used in the treatment of conditions affecting the spine caused by degenerative conditions, deformities or traumatic injury. BioLife Solutions, Inc. (BioLife), incorporated on March 25, 1998, is engaged in developing, manufacturing and marketing a portfolio of biopreservation tools and services for cells, tissues and organs, including clinical grade cell and tissue hypothermic storage, and cryopreservation freeze media and a related cloud hosted biologistics cold chain management application for shippers. The Company's product offerings include hypothermic storage and cryopreservation freeze media products for cells, tissues and organs; generic blood stem cell freezing and cell thawing media products; custom product formulation and custom packaging services; cold chain logistics services incorporating precision thermal packaging products and cloud-hosted Web applications, and contract aseptic manufacturing formulation, fill and finish services of liquid media products. IRADIMED CORPORATION (IRADIMED), incorporated on April 8, 2014, develops, manufactures, markets and distributes Magnetic Resonance Imaging (MRI) compatible products, and provides non-magnetic intravenous (IV) infusion pump systems. The Company operates through development, manufacture and sale of MRI compatible products and IV infusion pump systems for use by hospitals and acute care facilities during MRI procedures segment. The Company's MRidium MRI compatible IV infusion pump system has been designed with a non-magnetic ultrasonic motor, non-ferrous parts and other features in order to deliver anesthesia and other IV fluids during various MRI procedures. Each system consists of MRidium MRI compatible IV infusion pump, non-magnetic mobile stand and disposable IV tubing sets. Fonar Corporation (Fonar), incorporated on July 17, 1978, is engaged in the business of designing, manufacturing, selling and servicing magnetic resonance imaging (MRI) scanners, which utilizes MRI technology for the detection and diagnosis of human disease, abnormalities, other medical conditions and injuries. The Company operates its business through two segments: Medical Equipment segment, and Physician Management and Diagnostic Services segment. Its Medical Equipment segment is conducted through Fonar. Its Physician Management and Diagnostic Services segment is conducted through its subsidiary Health Management Company of America (HMCA). Harvard Bioscience, Inc., incorporated on October 8, 2000, is a developer, manufacturer and marketer of a range of scientific instruments, systems and lab consumables used for basic research, drug discovery, clinical and environmental testing. The Company's products are sold to thousands of researchers in over 100 countries through its global sales organization, Websites, catalogs and through distributors. The Company's product range is organized into three commercial product families: Cell and Animal Physiology (CAP), Lab Products and Services (LPS), and Molecular Separation and Analysis (MSA). The Company sells these products under brand names, including Harvard Apparatus, KD Scientific, Denville Scientific, AHN, Hoefer, Biochrom, BTX, Warner Instruments, MCS, HEKA, Hugo Sachs Elektronik, Panlab, Coulbourn Instruments, TBSI and CMA Microdialysis. The Company's products consist of instruments, consumables and systems that are made up of various individual products. Shandong Weigao Group Medical Polymer Co., Ltd. is principally engaged in the research and development, production and sale of single-use medical devices. The Company sells products under brand names of Jierui and Wego Ortho. The Company operates through three business segments. The Single Use Medical Device Products segment is engaged in the production and sale of single-use consumables, such as infusion sets, syringes, blood transfusion sets and blood bags. The Orthopaedic Products segment is engaged in the production and sale of orthopaedic products. The Blood Purification Products segment is engaged in the production and sale of blood purification products and related medical equipment. MicroPort Scientific Corporation is a Hong Kong-based investment holding company principally engaged in the manufacture and sales of medical products. The Company operates through seven segments. Orthopedics Devices segment researches, develops, manufactures and sells orthopedics devices. Cardiovascular Devices segment researches, develops, manufactures and sells cardiovascular devices, such as drug eluting stents. Endovascular Devices segment researches, develops, manufactures and sells endovascular devices. Electrophysiology Devices segment researches, develops, manufactures and sells electrophysiology devices. Neurovascular Devices segment researches, develops, manufactures and sells neurovascular devices. Surgical Management segment researches, develops, manufactures and sells surgical devices. Diabetes Care and Endocrinal Management segment researches, develops, manufactures and sells devices related to diabetes mellitus. China Grand Pharmaceutical and Healthcare Holdings Limited is a Hong Kong-based investment holding company principally engaged in the manufacture of pharmaceuticals. The main businesses of the Company include the research and development, manufacture and sales of pharmaceutical products, medical products, chemical products and healthcare products. The products of the Company include preparations, raw materials, medical devices, healthcare products, as well as agricultural and fine chemicals. Its products mainly focus on ophthalmic, cardiovascular and antibacterial, among others. Coloplast A/S is a Denmark-based company active within the healthcare sector. It is engaged in the development, marketing and sale of intimate healthcare products and services, targeting people with diseases of private and personal nature. Its operations are structured into four business areas: Ostomy Care offering products for people whose intestinal outlet has been rerouted through the abdominal wall, Continence Care products for people suffering from diseases of and damage to the urinary system, Urology Care products for people suffering from diseases of and damage to the kidneys, the urinary system or the male reproductive system and Wound & Skin Care for the treatment of chronic wounds and skin care products for prevention and treatment. The Company supplies products to hospitals, institutions as well as wholesalers and pharmacies. Bioquell Plc is engaged in the design, manufacture and supply of bio-decontamination and containment equipment, related products and services to the pharmaceutical, healthcare, food and defense industries, and testing services to the aerospace, telecoms, defense and other industries. The Company's operating segment is Bio-decontamination (BIO). The Company offers various products, which include Healthcare products, such as Healthcare HP Vapor Services, Healthcare HP Vapor Generators, Healthcare Patient Rooms, Healthcare Pharmacy Workstation, Healthcare Consumables/Accessories and Healthcare Archived Products; Life Science products, such as Life Sciences Aseptic Workstation, Life Sciences HP Vapor Services, Life Sciences Materials Transfer, Life Sciences HP Vapor Generators, Life Sciences Consumables/Accessories and Archived Products, and Defense products, such as Defense CBRN Filtration, Controls, Defense Pre-filtration, and Defense Consumables and Spares. Sartorius Stedim Biotech SA is a France-based international provider of laboratory and process technologies and equipment. The Company covers the segments of biotechnology and mechatronics. Sartorius provides services which help customers to implement complex and quality-critical processes in biopharmaceutical production and laboratory environments in a time- and cost-efficient way. The Company’s customers are from the biotech, pharma and food industries, as well as from public research institutes and laboratories. Sartorius operates its own production facilities in Europe, Asia and America, and also has sales offices and local representatives in more than 110 countries. The Company operates through its subsidiaries, including Sartorius Stedim Austria GmbH, Sartorius Stedim Plastics GmbH, BioOutsource Ltd and Wave Biotech AG, among others. Tristel Plc is a United Kingdom-based manufacturer of infection prevention and contamination control products. The Company's technology is a chlorine dioxide formulation. The Company operates through three segments: Human Healthcare, Animal Healthcare and Contamination Control. The Human Healthcare segment is engaged in the manufacture, development and sale of infection control and hygiene products, which include products that are used primarily for infection control in hospitals. The segments products are marketed under the brand, Tristel. The Animal Healthcare segment relates to manufacture and sale of disinfection and cleaning products into veterinary and animal welfare sectors. The segments products are marketed under the brand, Anistel. The Contamination Control segment addresses the pharmaceutical and personal care product manufacturing industries. Advanced Medical Solutions Group plc, together with its subsidiaries, designs, develops, manufactures, and distributes products for the advanced wound care, surgical, and wound closure markets worldwide. It operates through two segments, Branded and OEM. The company offers natural and synthetic polymers for use in advanced wound care dressings under the ActivHeal brand; medical adhesives for closing and sealing tissue under the LiquiBand brand name; and sutures and haemostats for the medical device market under the RESORBA brand. Fisher & Paykel Healthcare Corporation Limited designs, manufactures and markets medical device products and systems for use in respiratory care, acute care and the treatment of obstructive sleep apnea. The Company's segments include New Zealand, which includes all activities controlled by entities or employees based in New Zealand; North America, which includes all activities controlled by entities or employees based in the United States and Canada; Europe, which includes all activities controlled by entities or employees based in the United Kingdom, France, Germany, Sweden, Turkey and Russia, and Asia-Pacific, which includes all activities controlled by entities or employees based in Australia, Japan, India, China, South Korea, Taiwan and Hong Kong. Its products include respiratory humidifiers, single-use and reusable chambers and breathing circuits, infant resuscitators, infant warmers and accessories. In addition, the Company offers hardware and consumables. Biotage AB is a Sweden-based company that develops and sells systems, consumables and services in the field of life sciences. Its customers include pharmaceutical and biotechnology companies, companies within the food industry and academic institutions. The Company offers systems and services within three areas: analytical chemistry, organic chemistry and industrial resins. Biotage’s offering within analytical chemistry consists of consumables with related applications to extract selected substances from various types of samples. The Company’s offering within organic chemistry includes products for pharmaceutical development based on both small molecules and peptides and its offering within industrial resins is composed of polymer-based resins and research services that lead to the development and manufacture of polymer-based materials. As of December 31, 2013, the Company operated 12 wholly owned subsidiaries worldwide. Amplifon SpA is an Italy-based company engaged in the hearing systems industry. It distributes, adjusts and personalizes the hearing aids. It offers a generation of invisible hearing amplifiers tiny electronic instruments which receive, process and amplify sounds that are then transmitted to the ear thanks to its clear and precise amplification process. They are able to meet needs as they address a wide range of problems stemming from slight to more serious hearing loss. The hearing aids ensure consistent listening quality as they adapt to the different sound environments. It operates through following brands: Sonus, Miracle Ear, Beter Horen and Dialogue, among others. It operates through numerous direct stores, franchises, sales outlets and contact points in the Netherlands, France, Canada, the United Kingdom, Switzerland, Spain, the United States, Egypt, Australia, New Zealand, Germany, such as Focus Hoeren AG and Die Hoermeister GmbH, and India, among others. Gerresheimer AG is a Germany-based company that is active in the pharmaceuticals and health care industry. It operates through two business segments: Plastics and Devices, and Primary Packaging Glass. The Plastics and Devices segment produces standard and customized products for drug delivery, such as insulin pens, inhalers, and prefillable syrings. The Primary Packaging Glass segment focuses on the production of packaging of glass for medicines and cosmetics, such as pharmaceuticals jars, ampoules, injection vials, cartridges, perfume flacons and cream jars, as well as glass containers for the food and beverage industry. The Company operates approximately 40 production facilities in Europe, North America, South America and Asia. Ypsomed Holding AG is a Switzerland-based holding company engaged in the manufacture of injection pens for pharmaceutical and biotech companies. The Company develops and manufactures injection systems for custom-made self-administration, and markets pen needles for the treatment of diabetes, growth disorders or infertility, as well as therapeutic areas. The Company operates two business segments: Injection Systems and Diabetes Care. In the Injection Systems segment, the Company's YDS Ypsomed Delivery Systems offer a range of ready-to-use injection systems for pharmaceutical and biotech companies to administer of drugs or to develop and manufacture them in line with customer requirements. The Diabetes Care segment markets products such as pen needles or insulin pump to diabetics, doctors and health insurance providers. The Company operates its production sites in Burgdorf, Solothurn, Grenchen and Tabor, and sales and distribution network across Europe. TransEnterix, Inc., incorporated in August 19, 1988, is a medical device company. The Company is focused on the development and commercialization of ALF-X Surgical Robotic System (the ALF-X System), a multi-port robotic system, and SurgiBot System, a single-port, laparoscopic surgical platform. The Company also develops and manufactures laparoscopic surgical instruments that are used in abdominal surgery, such as scissors, graspers, clip appliers, and suction and irrigation instruments. The Company's ALF-X System is a multi-port robotic surgery system, which allows multiple robotic arms to control instruments and a camera. The system features advanced technology to enable surgeons with haptic feedback and the ability to move the camera through eye movement.